I've been married since 1974. 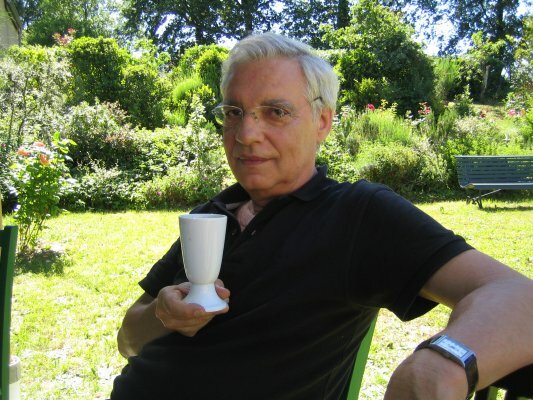 My wife Francoise (who is a medical doctor) and I have a single child, a daughter named Sophie, born in 1977, living and working (in a publishing company) in London, UK. I am a journalist, working for paper magazines. I got my ham license and callsign F6HIQ in 1981. Before, I'd been a SWL with a callsign of FE11026. When I was a young boy, building galenium crystal receivers, my wish was to become a radio officier in the merchant navy. 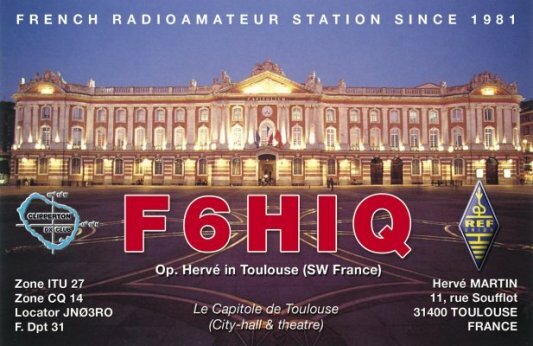 It was not possible, so much later, I became a radio amateur and for 15 years, sailed aboard two small sailing boats, using from time to time the callsign F6HIQ/MM. As a radio amateur, I've been busy on HF and SSB only for 26 years, with low power (100 W, not so low, Hi!) and a simple 3 band GP antenna on the balcony (I'm in the center of Toulouse - SW France, living in a flat at the last stage of a 4 stories building), working 250 DXCC countries and 49/50 American states (I still need the state of Idaho!!) on 10, 15 and 20 meters. 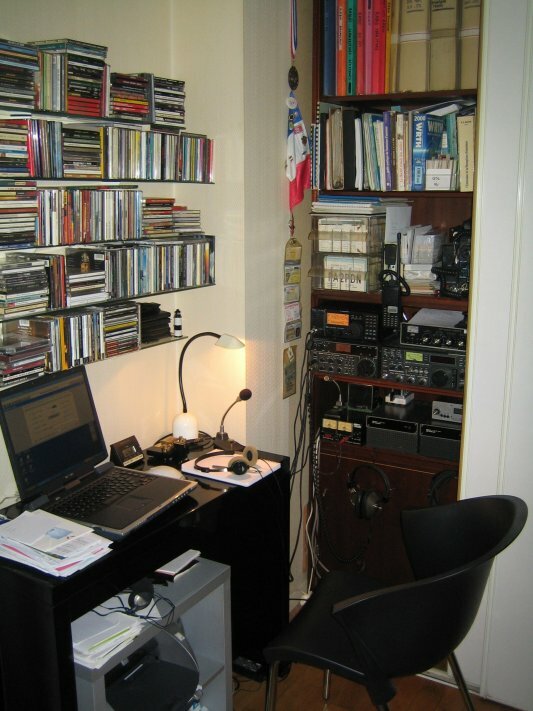 I've always been interested in QRP, reading ARRL's "QRP Power", and many French and English publications. That's why, this year I'm trying to come back to CW. 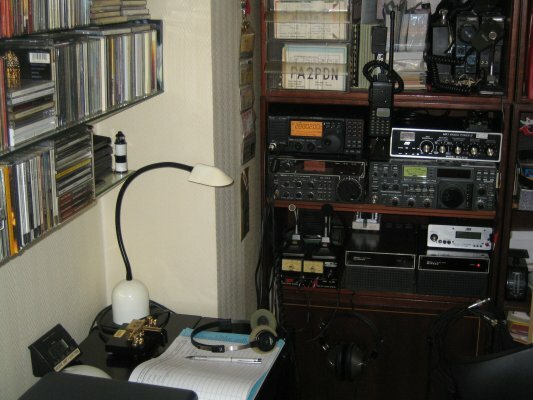 I had lost all my CW and in the last 3 months, I've learned it once again (with CD's and listening to CW traffic on 20 and 40 meters) during half an hour to one hour every day. It's difficult, but I like that. An Electronic keyer and iambic key were new for me, but I like using them. I well understand that you prefer straight keys! During my next summer holidays I plan to build a 1-W 20-M QRP TX (to use with the RX of my IC 718), and - if it works - I'll use it with my old Hy-Mound straigt key. Just one thing more: I like very much the true ham spirit of QRP. That's really the kind of radio I was dreaming about, and the spirit of CW users (so patient with me) seems to be much more friendly, attentive and respectful. Radio is still really magic for me! Here are two views of my simple station, hidden behind a sliding door, in a corner of our living room. These 2 pictures are showing, from top: an IC-T2E handie-talkie (2M FM), an IC-202 (2M SSB) and an IC-215 (2M FM). My VHF antennas are a vertical 5/8 and a 4 el. quad, without rotator, both settled only when I have to be on the air... less than one time a year! For the HF equipment: IC-718 (with 250 Hz CW filter), placed on an old IC-701, with an IC-751 on the side, itself on a MFJ-941D Versa Tuner II. On the small desk, a computer (for log and news), Kenwood HS6 headphones and the new Kent twin paddle key (wife and daughter's gift last May, for my 59th birthday!). If you have good eyes, you can see 2 straight keys on the MFJ tuner: Hy-Mound HK707 and HK708. To complete the information, the HF ground-plane is 3 bands with traps: a VR3 by Jaybeam Ltd, used for over 20 years now. It is fixed on a short mast screwed to the metallic hand-rail of the balcony, at about 40 feet above ground level. The 5 radial wires of the GP are all tightened in the same direction, all along the hand-rail. It's not the best way, I know, but I have no choice... and it works well (I just need the antenna tuner over 28.5 MHz). One of these days, I'll change it for a 4 band GP (4BTV, 14AVQ or something like that) to be able to go on 40 M, in QRP CW of course. With my very 73 to all of you.